The United States is an immigrant country. Germany is not. This volume shatters this widely held myth and reveals the remarkable similarities (as well as the differences) between the two countries. 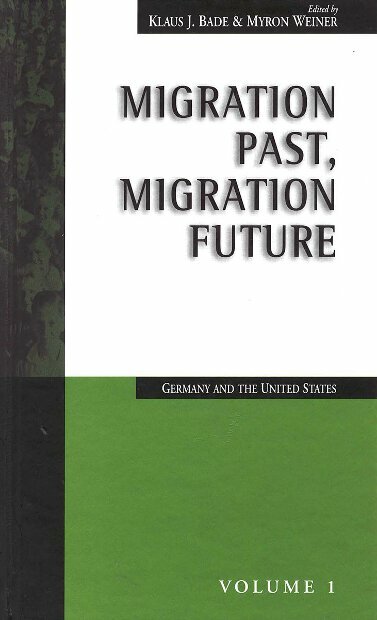 Essays by leading German and American historians and demographers describe how these two countries have become to have the largest number of immigrants among advanced industrial countries, how their conceptions of citizenship and nationality differ, and how their ethnic compositions are likely to be transformed in the next century as a consequence ofmigration, fertility trends, citizenship and naturalization laws, and public attitudes. Klaus J. Bade is the Chair for modern history and director of the Institute for Migration Research and Intercultural Studies (IMIS) at thge University of Osnabrück. Myron Weiner is Ford International Professor of Political Science at the Massachussets Institute of Technology and former director of the MIT Center for International Studies.